Our delicious range of local festive Chickens & Geese are bred, hand reared and hand selected from the finest of our Nidderdale farms. Our Christmas Ducks are bought from the famous Gressingham Farm - in our opinion the finest available. 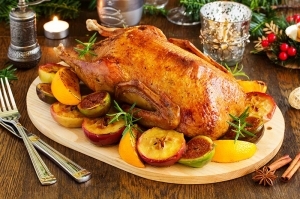 Taste Tradition - The often over looked Christmas Goose was always the original Christmas Dinner - long before the humble Turkey came along!